The Alliance Française de Sydney is an independent, not-for-profit language and cultural organisation promoting Franco-Australian exchange since 1899. With an ambitious mission to spread the French language and culture well beyond the borders of France, it is one of the 819 Alliances Françaises existing in 137 countries all over the world. 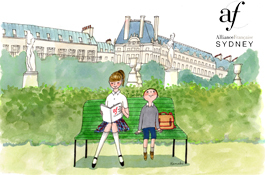 The Alliance Française offers French courses for all levels and all ages in Sydney CBD. Situated in the heart of Sydney in an attractive building designed by the famous architect Harry Seidler, the centre offers French courses, holds cultural events and includes a media centre and a French café, « le Grand Café ». In August 2012, the Alliance Française has also opened a new branch in Chatswood, offering the same courses as the CBD branch for North Sydneysiders. Since 1989, the Alliance Française de Sydney has organised the annual Alliance Française French Film Festival. This prestigious festival has become a very important event in Australia with an exponential increase in attendees every year. In 2014, attendees totalled 157,000 across Australia and 49,000 in Sydney.